Black Panther. Release: Series 10. Factory Sealed Marvel comics Limited Edition . Marvel Gold Black Panther. The figure is still sealed in its original package. The package has a little wear but in its in good shape. This item is very clean and has been examined thoroughly. Includes: Figure with removable cape. Size: 6.25", 1:12 scale. Condition: Torso has some looseness; overall great and all other joints are tight. 100% guaranteed to be received as listed. See pictures. Item pictured is exact item you will receive. 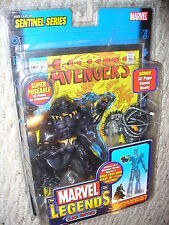 Up For Sale Marvel Legends 6" 2005 Action Figure Sentinel Series Black Panther Toy Biz HTF (Look at pictures) Sold as is! Ready to ship! Great to add to your collection!! Payment must be made within 3 days of ending listing ! Serious buyers only !!! please contact for any questions you may have,PayPal only! Includes Sentinel right leg. Characters - Mr Sinister. 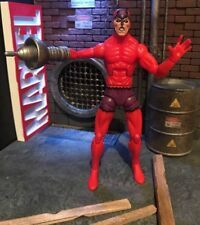 Series - Marvel Legends. Baf with right arm nip. ready for play or display. Marvel Comics Marvel's Gold Collector's Edition: BLACK PANTHER Action Figure! Marvel Comics Marvel's Gold Collector's Edition. 5 out of 5 stars - Marvel Comics Marvel's Gold Collector's Edition: BLACK PANTHER Action Figure! 1 product rating1 product ratings - Marvel Comics Marvel's Gold Collector's Edition: BLACK PANTHER Action Figure! 42 Points of articulation. One of the rarest of series! 2005 Toy Biz/Marvel. light shelf wear on plastic shell, couple of bends on bottom. However, due to changing market conditions our prices can and do fluctuate. BOX IS IN VERY-FINE CONDITION WITH MINOR SCUFFS. SENTINEL SERIES - BLACK PANTHER. Been in storage for a decade, good condition.